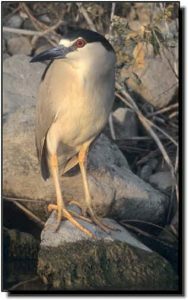 Comments: Common throughout the Great Plains, Black-crowned Night-Herons use a variety of different habitats, including wetlands, pastures and coastal areas. Primarily active at night, dusk and dawn, they also feed during the day. They are opportunistic feeders eating fish, amphibians, reptiles, rodents, invertebrates and even bird eggs and chicks. They are colonial nesters, most commonly rebuilding old nests of sticks and reeds in bulrush stands or in trees. Immatures are most likely confused with American Bitterns and immature Yellowcrowned Night-Herons. Black-crowned Night-Herons are stockier with thicker necks, browner backs, longer, thinner bills and paler necks, chests and bellies. In flight, their feet barely extend beyond the tail. Adults of both night-heron species develop long, off-white head plumes during the breeding season. Black-crowned Night-Herons take 2-3 years to reach sexual maturity.